Getting a smooth, sleek body contour can be challenging to achieve through diet and exercise alone, especially if genetic factors are working against you. However, this doesn’t mean that your dream body is forever out of reach. For individuals who are committed to enhancing their figure, why not try CoolSculpting®? Battle Creek men and women use this procedure to achieve their ideal body contour. If you’ve tried every trick in the fat reduction book but still can’t seem to get rid of the stubborn bulge around your waist, CoolSculpting® in Battle Creek may be the solution you need. This cosmetic procedure can be perfect for patients who want to remove unwanted fat from certain areas of their body. By opting for CoolSculpting®, Battle Creek patients can achieve their desired figure in no time. 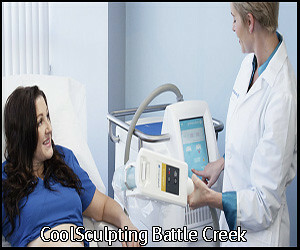 What Is CoolSculpting® in Battle Creek? CoolSculpting® is a clinically proven, non-invasive procedure that can take unwanted fat away without needing surgery. Through cryolipolysis, CoolSculpting® in Battle Creek targets, cools, and reduces fat cells without damaging the skin, blood vessels, or nerves. After CoolSculpting® in Battle Creek is performed, patients typically notice a reduction of fat in the treated area after just one visit. What Are the Benefits of CoolSculpting® for Battle Creek Patients? Imagine if after adhering to strict exercise routines and diet plans, you still weren’t able to achieve your dream figure. This can cause you to feel discouraged and frustrated. Thankfully, through CoolSculpting® in Battle Creek, you can get the toned figure you’ve been working hard for. When you look good, you feel good. This is what CoolSculpting® in Battle Creek can help you with. By getting rid of unwanted fat and reducing bulges through CoolSculpting® in Battle Creek, you can more easily regain your confidence. Do you want a leaner and more toned figure but don’t want to undergo surgery? CoolSculpting® in Battle Creek could be the solution you’re looking for. This non-invasive treatment can allow you to enhance your body contours without going under the knife. Since CoolSculpting® in Battle Creek is a completely non-surgical procedure, it has little to no downtime. Immediately after you undergo CoolSculpting® in Battle Creek, you can typically go on with your day and return to your normal activities. Depending on the size of the body part being treated, CoolSculpting® in Battle Creek can be completed promptly. Most procedures even last for only a few minutes. After your session, you can go back to doing your daily activities. Also, unlike other cosmetic treatments, opting for CoolSculpting® in Battle Creek won’t require you to take pills and supplements. As long as you maintain your weight with normal diet and exercise, the results of the treatment should remain stable. Some people worry that when they undergo cosmetic treatments, the results won’t look natural. This won’t be an issue with CoolSculpting®. Battle Creek residents who go through with this procedure usually gain natural-looking body contours that begin to show gradually over time. After CoolSculpting® in Battle Creek, you can start seeing visible changes in as early as three weeks. The most dramatic results, however, will start showing after one to three months. Get the figure of your dreams by scheduling a session with Restorative Health Care. We offer various cosmetic treatments, including CoolSculpting® in Battle Creek. Contact our team, and learn more about our CoolSculpting® treatment today! Click here to learn more about our CoolSculpting treatment.